The monastery of Agia Irini is located 25km south of Heraklion and 3km west of Kroussonas village, at an altitude of 630m. 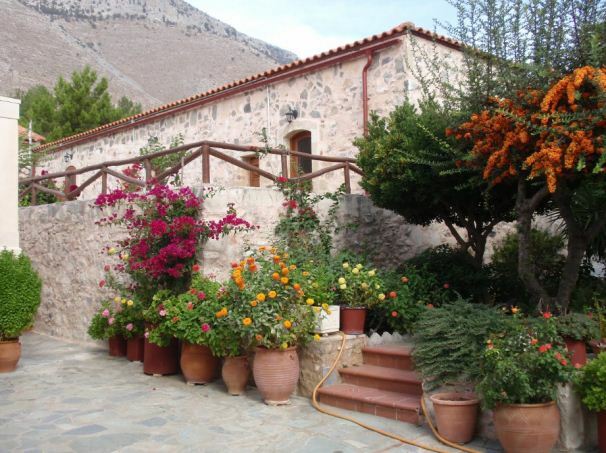 It is among the oldest and most prospering monasteries in Crete and very well preserved by the nuns. The two-aisled church of the monastery is dedicated to St. Irene and the Assumption and is celebrated on May 5 and August 15 respectively. It is believed it was built at the end of the Venetian Era and belonged to a Catholic feudal family. In the years of the Ottoman occupation the monastery had developed considerable social activity and functioned as a hideout for the rebels against the Turks. In 1822, after they had destroyed the village of Kroussonas, the Turks slaughtered all the monks of the monastery. Its restoration started in 1936 by priest Demetrios Fasoulakis and in 1944 the monastery reoperates as a nunnery. Visited this heart warming place in 2014. It’s not its beauty you should be seeing it’s the true meaning. The coach pulled up out side the monastery, we were greeted by a tall pretty nun with long fingers, I noticed her long fingers coz I also have very long fingers and for a split second I thought we were related haha. Thought i would pay a visit to kill time but i am truly glad i did. It was peaceful and you really felt welcomed. The lovely nun gave us a tour in quite a few languages which was anther lesson for me coz I must admit didn’t know nuns were so intelligent (shame on me). It W’s also nice to hear a church service with women and not men, kind of reminded me of the movie sister act but much better. They also have a little Shop there with lovely keep sakes. Had some bread which was very nice and tasty, amazing views are all around you. When it was time to leave, the nun gave me such a soul felt smile, it was like grannys and grandads, mum and dads hugs (which ive never had) all wrapped up in one. Later on that day when I got back to the hotel, I Google St Irene story. Wow!! Well worth the read and when I get a chance me and my son will pay another visit.